The United States Government is to support the cultural preservation of documentary film heritage of Sri Lanka through the U.S. Ambassador's Fund for Cultural Preservation. Over 1000 of Sri Lanka's finest historical and artistic documentary films, in the care of the Government Film Unit (GFU), will be catalogued or preserved under the Ambassador's Fund for Cultural Preservation. One-hundred of them will be digitized and documented to enable future generations of Sri Lankans to view and enjoy. 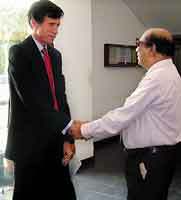 Ambassador Robert Blake greets veteran filmmaker and script writer Tissa Abeysekera at the launching of the project. The US$20,000 project is targeted to be completed in one year. "During the time I worked with the Sri Lanka Rupavahini Corporation, I often had to depend on valuable archival footage available at the Government Film Unit (GFU), for the making of news and current affairs productions. Though this material is a unique visual record of this country's history, perhaps unparalleled in South Asia, about 60% of this material has deteriorated or perished due to neglect," said Sharadha de Saram, the Project Director. "I am very pleased that GFU has received financial assistance from the U.S. Ambassadors Fund for Cultural Preservation to document and digitize some of the most valuable archival footage available in Sri Lanka. With this project these precious footage would be available for Sri Lankan documentary film makers and researchers and to all those interested in the cultural heritage of our country. "By taking a leading role in efforts to preserve cultural heritage, we show our respect for other cultures and peoples," said Ambassador Blake. "I chose this project because documentary film is not only a cultural heirloom but a powerful tool in educating and raising social consciousness. Film break down divides to reach all levels of society, from the highly-educated to the illiterate, from those speaking English, to those speaking Sinhalese or Tamil." Consultant Film Historian, Tissa Abeysekera, will contribute his professional knowledge and experience in film to the project, with a focus on the historical, social and cultural value inherent in the material. In a ceremony at the Ministry of Mass Media and Information on Wednesday, September 17, Minister of Mass Media, Anura Priyadarshana Yapa and Information and U.S. Ambassador to Sri Lanka Robert Blake exchanged grant documents to launch the program. The U.S. Ambassadors Fund for Cultural Preservation (AFCP) was established in 2001 to help developing countries preserve their cultural heritage. The AFCP emphasizes the preservation of the world's cultural patrimony as an integral component of U.S. foreign relations. The project was nominated by Ambassador Robert Blake, and was one of only 68 selected for funding in a worldwide competition of over 184 nominated projects.